Once a man was walking along a beach. The sun was shining and it was a beautiful day. Off in the distance he could see a boy going back and forth between the surf's edge and and the beach. Back and forth this person went. As the man approached he could see that there were hundreds of starfish stranded on the sand as the result of the natural action of the tide. The man was stuck by the the apparent futility of the task. There were far too many starfish. Many of them were sure to perish. As he approached the boy continued the task of picking up starfish one by one and throwing them into the surf. As he came up to the boy he said, "You must be crazy. 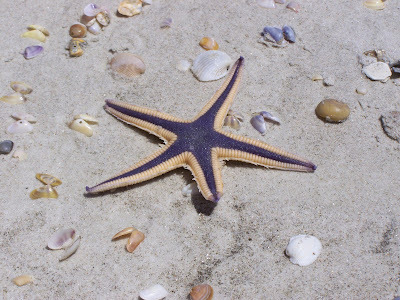 There are thousands of miles of beach covered with starfish. You can't possibly make a difference." The boy looked at the man. He then stooped down and pick up one more starfish and threw it back into the ocean. He turned back to the man and said, "It sure made a difference to that one!" This has always been one of my favorite "wise stories," or motivational stories. Technically, it was pasted on the walls of the bathroom stall at the school that I worked at, so, you know. But it has really grown on me. Thinking about how little things can make a difference to people. It just has me thinking, that's all.